Our facility offers two separate housing programs with a total of 36 beds for men and women 19 years of age or older along with three separate shelter programs with a total of 56 beds for men, women and children. Our client-centered environment helps staff and participants create a positive trusting relationship where opportunities for change can be discovered. ​In-House Programming runs Monday through Friday from 3:00 pm to 4:00 pm we offer rehabilitation based groups for our residents and guests (clients). Referrals from outside agencies will be accepted. Scheduled programs are adapted during summer months. ​We have partnered with many of our fellow community agencies and boards to provide the best continuum of care for those who stay with us. The Northern Centre of Hope has designed pro-active Programs for those who have reached a point in their lives where they are ready to move forward out of poverty and address the barriers that prevent the acquisition of sustained housing and career employment. These Programs incorporate a holistic approach providing practical, emotional, social, financial and spiritual life skills, support and tools necessary for those who are homeless or those at risk of being dispossessed. The primary goal is to integrate these individuals back into their community as self-sufficient citizens. 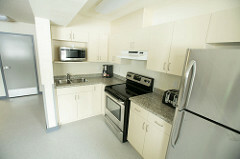 This program has 24 beds for men and women 19 years of age or older. Open year round, we offer three meals per day, personal development planning, caseworkers and referral services. 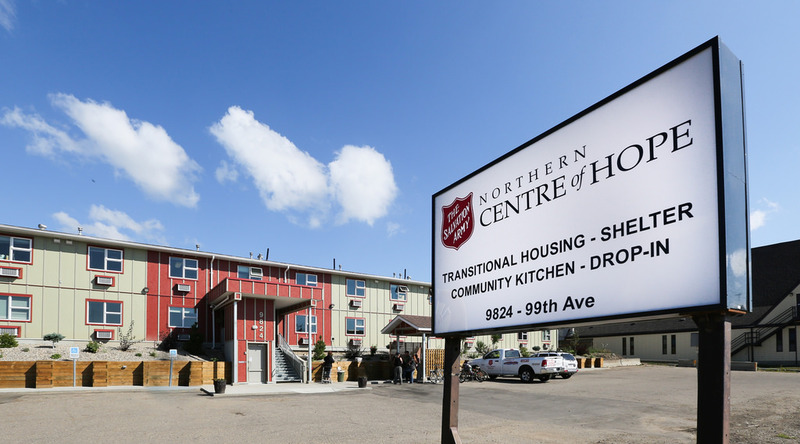 The Northern Centre of Hope provides a room and board housing program for the homeless or individuals who are at risk of homelessness. The goal is not simply to get people off the streets but to provide a comprehensive array of supports that assist people in achieving stability which allows them to move forward with their lives. Our client-centered environment helps staff and participants create a positive trusting relationship where opportunities for change can be discovered. The Northern Centre of Hope provides supportive transitional housing for individuals who have completed addictions programming, have a serious and persistent mental illness or concurrent disorder. The Northern Centre of Hope has designed a pro-active program for those who have reached a point in their lives where they are ready to move forward out of treatment and address the barriers that prevent the acquisition of sustained housing and career employment. This program is a holistic approach providing practical, emotional, social, financial and spiritual life skills, support and tools necessary for those who are ready for second stage living in their lives. The primary goal is to integrate these individuals back into their community as self-sufficient citizens. The high-barrier program is available to people who are clean and sober from all substances. These individuals will be in supportive transitional housing setting for a up to two years and are expected to meaningfully participate in personal development planning who have completed addictions programming, have a serious and persistent mental illness or concurrent disorder. This program is tailored to meet the needs of individuals who have completed addictions programming, have a serious and persistent mental illness or concurrent disorder. Applicants who show a sincere desire to change the cycle of addiction in their lives will be accepted into the program on a case-by-case basis. 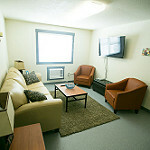 The Northern Centre of Hope Emergency Shelter program also has a designated family room which can house a family of up to six people. This program is in operation from November 1 to March 31 yearly. An extreme weather alert is issued when temperatures drop below -5 degrees. 28 beds are available for men and women. Check-in is daily at the front desk between 8:00 am and 1:00 pm. Our drop in is open 8:00am and runs through our community Meal program. During the drop in, guests can enjoy fellowship, games, access to case workers. A Hot lunch meal is offered Monday thru Saturday free of charge and open to the community. Meals are served between 12pm and 1pm. Volunteers are always welcome during this time. More information about volunteering can be found here.